Hey! 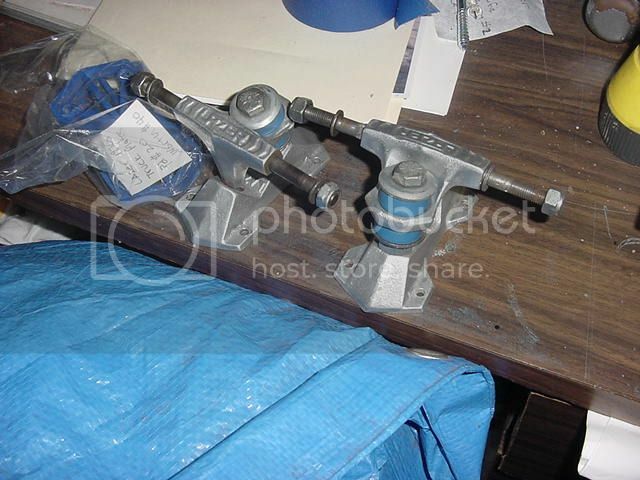 I just scored a nice set of Lazer trucks. The bushing have been replaced, they are blue and the pivot cups are black. I want to make them stock, so does anybody know what colors they should be? I think the bushings are supposed to be blue, but the ones I have appear to have darkened over time, so they look black at first glance. Not sure about the pivot cups. Always has been a mystery to me.... Both??? 1979 ad.... look black when I highlighed them on inna-nets. Always do a search and check Collector's Corner first http://bulldogskates.websitetoolbox.com/post/lazer-trucks-2803039?trail=15. See post #17 in that thread by cress5. 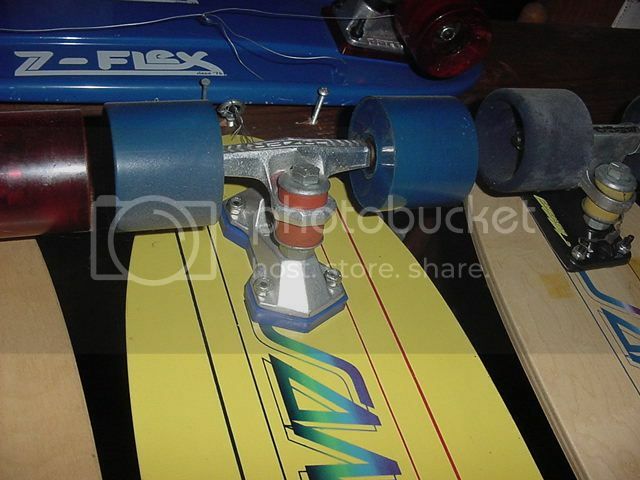 There's blue bushings, red bushings and amber looking pivot cups. Also check the ads and pictures posted in the thread. Looks like the later conical blue bushings held their blue color pretty well. So, be sure you don't chuck the bushings you have before confirming they're not OG. (I once chucked an ugly looking plywood riser thinking it was home made junk. That was before I knew the first gen Tracker risers were plywood. Doh!). Good luck finding pivot cups. If you happen to find any, let me know. I need a set. Also check post #18 as to colors of Lazer bushings. White for a firm tight ride. Light blue for a softer ride. Hard to see in my usual crap photo, but there's both kinds of blue bushings, the usual light blue, and the darker almost black ones. The early trucks had the Red rubber bushes. The Blue bushes are also an OG colour but I think they went on the later trucks like the Grinders. Which trucks did you get Ridingthestorm? Post a picture. Wow thanks! You guys gave me a lot of brain food to take in. Mine are the very early narrow ones, NOS. Red bushings w amber cups. I like the blue cushions, that had the Lazer logo on em! 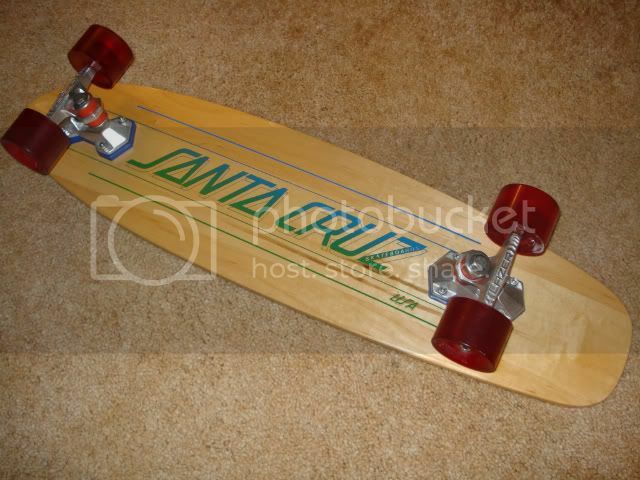 I've a set of the older slaloms with red bushings. As a kid I had a set of Grinders which had blue bushings. 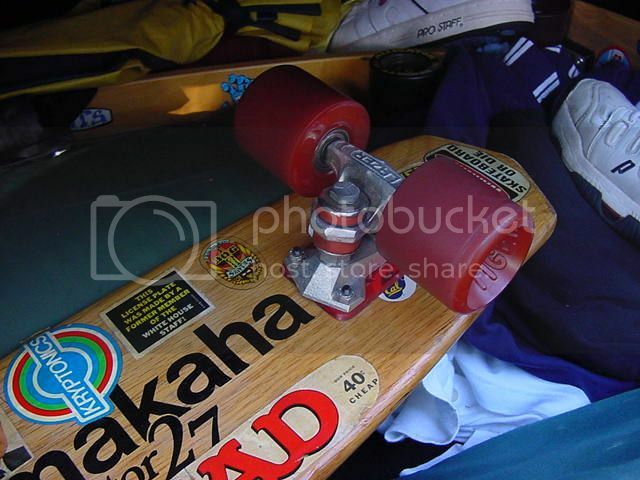 I also remember buying replacement blue bushings in a pack called 'Stabilazers' which came with a 'Stabilazer' sticker. I have 3 sets of Lazers... I call them "slalom" style. Had at least 8-10yrs each set. Ebay purchased.